Take the sweet corn kernels in a pressure cooker. Add 2 to 3 cups of water and a pinch of salt. Cook for 5 to 6 whistles (until they become tender) and keep aside. Heat oil in a pan. 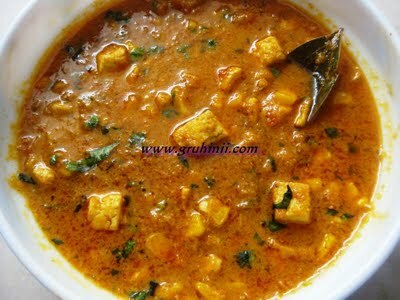 Chop paneer to cubes and shallow fry until they turn golden color. Remove from the oil and keep them aside. Now in the remaining oil add coves, cinnamon and bay leaf. Add ginger garlic paste stir fry and add onion paste. Fry until the paste is cooked properly. Now add red chilli powder, haldi powder and salt to taste. (you can also add a tea spoon of sugar too/optional) Mix well, fry for a while and add tomato paste and green chillies. Fry until the tomato paste is well cooked and looses the raw smell. Now add the boiled sweet corn kernels and paneer to it. Mix well and add 2 cups of water.